I need time to process things, whether good or bad. When it is good I relish in how God has brought us to this point and see how His providence has worked to get us to this place in our lives. When it is bad…I have to really meditate and ponder why a certain event took place because there HAS to be some GOOD in it somewhere. Were we being protected? Were we being stalled to allow another event to happen for our benefit? Maybe I’m reading way too much into it, but it is the ONLY way I can keep a positive mind set and not get caught up in the depression that can easily set in when you dwell on “Why did this happen?! ?” Causing you to just stop and not move. I’m just now able to write about a recent event that really challenged us. We had plans over Christmas to join our extended family but it was important for us to enjoy Christmas morning in our Dirty Diamond and enjoy the fruit of our labor with our children. The living room looked so warm, inviting and festive with the Christmas tree twinkling and presents waiting to be opened. After opening our gifts to one another we packed the car up and headed to Houston for a 2nd Christmas with my husband’s parents and family. We were only planning to be gone for two days and return at the end of the weekend but then soon discovered alongside my sister and brother in law that the weather in Texas was going to be C.R.A.Z.Y. on the day we would be driving home. 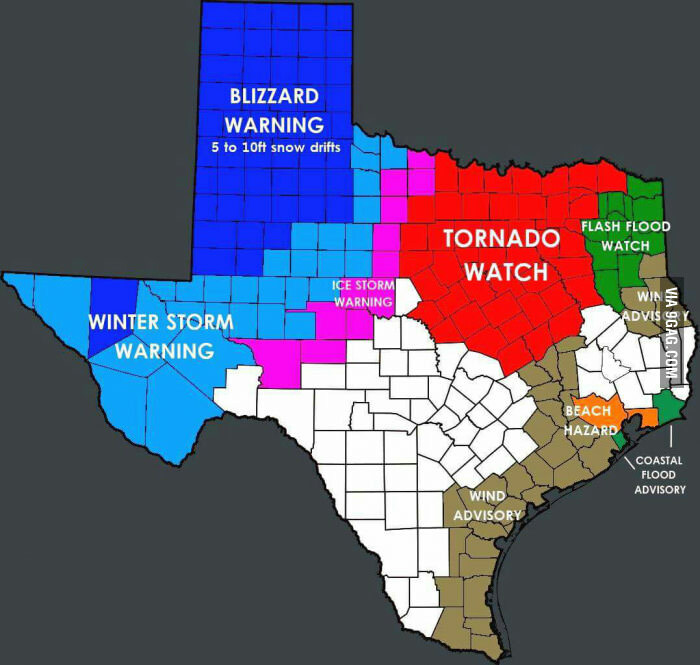 In west Texas there would be snow and ice and the rest of Texas would be dealing with possible tornadoes (which is sooooo strange for this time of year) and heavy rain and flash floods. My brother and sister in law decided to cut their time short and leave early to avoid some of the really bad weather and we contemplated staying an extra day to avoid bad weather, but as I was getting ready for church services that morning I had a sudden knot in my stomach. It was a certain sick feeling of dread and it dealt with the house. I immediately walked into the room where Jonathan was and I told him my concern. He did his best to ease my mind but it hung over me all day and especially as we fought the rain and lightening on the drive home. The amount of water that flowed on the sides of the highway and roads was immense. When we finally made it home Jonathan went inside first to open the doors for all of us so we could make a MAD DASH inside through the rainfall. He quickly darted back outside and my usually calm and steady husband announced “Your premonition was right!” Not the words you want to hear when it comes to bad “premonitions”. I ran into the house and was set back when I saw that water had come into the house; the living room, the girls’ room, and the bathroom. Adrenaline kicked in I guess, because we both started lifting furniture like Superman lifting a car and began for the next hour sucking up the water with our Shop Vac, carpet cleaner, and towels. We soon found ourselves moving bedroom furniture and toys into the sun room (this was a familiar sight since this is what the sun room looked like when we first took our initial steps into moving into this house back in March-very depressing). The darker blue is the wet areas. Then we were pulling back the carpet, moving that into the sun room as well and putting fans and running a De-humidifier over it. 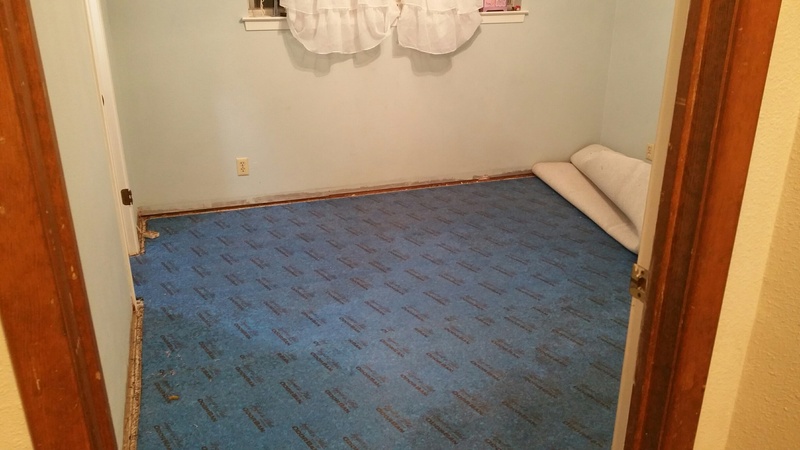 The entire carpet pad was soaking wet and needed to be taken out completely and thrown away. By the end of our evening we were NUMB. We just stared into space. There were no words. No one to blame. The wooden floors were swollen and buckling. Would insurance cover this? Jonathan was also on the phone trying to get answers from our insurance but all we could do was file a claim and wait to hear back from an adjuster. But it wasn’t looking very good as we carefully read the fine print about what “kind” of water damage they would cover. At this point we weren’t even sure where the water was coming from. If it were an internal issue where a pipe busted or toilet backed up then insurance would cover it. But water that came in forcefully from outside would not be covered. Girls’ furniture moved into living room to put weight on the wooden floor boards to help push them back down. This is several days after our flood findings. 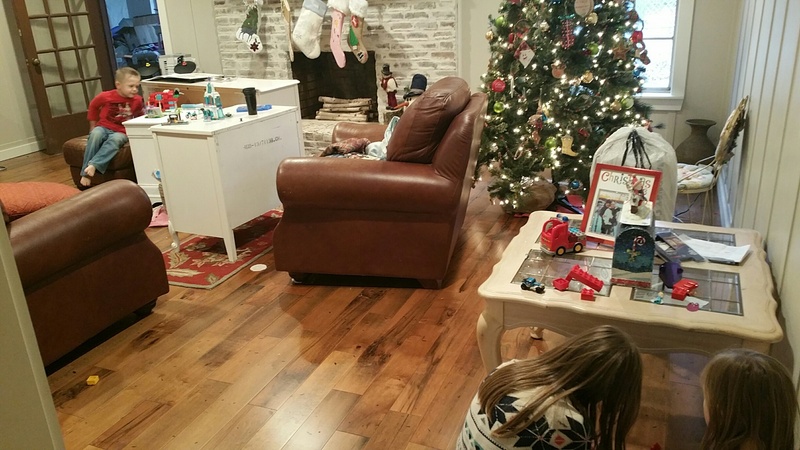 Kids playing with their Christmas gifts where ever they could find a place to play. They are such troopers! If you are wondering ‘were there tears?’ Yes, there were…but not until Tuesday, three days later. Jonathan called me from work during his lunch break and we spoke to one another like robots. He told me about a conversation he had with a sweet co-worker that learned about our unfortunate event. She told him, “Your family will get through this! It is so obvious to all of us that God is with your family and takes care of you.” And that is when the tears finally came down my face. It was then that I changed my way of thinking and knew God would be with us and I needed to trust Him! We did lose some time and money but others lost homes and even lives over this same weekend where tornadoes destroyed all that they had. To make a long story short, after talking in detail with an insurance adjuster and a Leak Detection company it wasn’t looking favorable that insurance would cover it (Got to LOVE insurance companies! You pay for it but they find ways to get out of it in the fine print). Jonathan located a small pin size hole on the side of the house where the A/C pipes came into the house. We tested a possible theory on how the water might have found its way in and it appeared to be the culprit. Bittersweet to find the cause. We certainly didn’t want to re-install the carpet (which we saved in time–pad, nope) if we couldn’t locate the problem. We never want to experience that kind of feeling again. The wood floors are probably what shook us up the most. We had just labored on those floors two weeks prior. We were so proud and felt so accomplished. We ran a dehumidifier non stop for several days and even up until today. Every day I would look at the floor in disbelief. I asked Jonathan, “Is it just me…or do the floors look like they are getting better?” He also noticed the difference. To our astonishment the floor has pretty much gone back to its original state! There are a couple of places that I can tell where a board is damaged but if I didn’t point it out, you would never notice. SERIOUSLY! 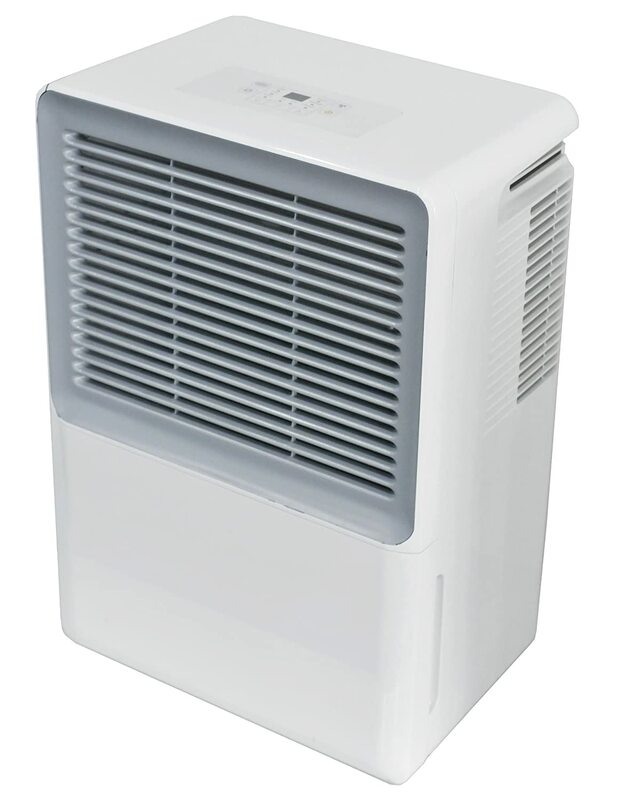 BUY a De-Humidifier if you live in the south and struggle with humidity! It is worth its weight in GOLD!! Ours came from Amazon.com and we paid around $165 for it!! It is truly amazing the amount of water we dump out of its basin every day. I water my plants with it! We bought it back in the summer when we had a lot of humidity in the air. It seemed to dry our air out and take the mildewy smell out of the house. So going back to my first paragraph, what can I take away from this that is positive so that it doesn’t crush me or make me wonder what lesson I’m to be taught. Here it is and it is what has brought me a sense of thankfulness and joy, believe it or not. When we pulled up the recent installed carpet in my girls’ room, we discovered the new tack strip that held the carpet down in one area was producing mold. This tack strip has been there since this summer! This particular area is where we discovered the small, pin size hole on the outside wall. There has probably been moisture coming in that space for a long time but the recent heavy rain really exposed it. Was this God’s way of protecting my children from serious illness? Did something like this have to occur so that we could be made aware that there was potentially something very dangerous to my family under their carpet? I believe so! And I’m so grateful! I’m not mad or sad or depressed. We need to fix the problem and keep on moving! And that is what we will do! Next > A YEAR!?!?! Already?!?! !